Ultimately, the Runoffs are just another race but it is indeed a race on steroids. Runoffs Fever catches out many a club racer. The top dogs are all there, playing their very best cards. With testing, some will be there for two weeks. Points don’t matter; it is a winner-take -all situation. The temptation to overdrive the car is overwhelming. Lately, a lot of folks disparage the Runoffs because it is not as hard to qualify as it once was. Getting there isn’t the issue, winning is. If you hope to run anywhere near the front of any class, you'd better pack your lunch. Lisa Noble, SCCA President and CEO recently said, “We are predicting 700 entries and crowning 28 national champions this year. It is our return to Daytona for the first time since 1969. There will be a thrilling Spec Miata race under the lights that is Friday Night Lights presented by Mazda. We’ll have great drafting battles for every class on the high banks and it should make for an epic 2015 SCCA National Championship Runoffs.” Over 4,000 people have summited Mount Everest. Fewer than 1,000 have stood atop the rarified air of a Runoffs podium. A SCCA National Championship is still a very big challenge. The first time I went to the Runoffs in 1982 to crew for Jim Oseth I thought I’d died and gone to heaven. I returned the next year as a driver and have subsequently competed in twenty-two Runoffs. I never made the top step, but I had nine top 10’s including a silver and a bronze in tough FV races. I learned a lot about trying and about trying too hard. The first time I coached at the Runoffs in 2010, one of my clients, Rick Shields, won the FV race and was awarded the Kimberly Cup for Most Improved Driver of the Year. In his six prior tries, Rick‘s best finish had been ninth. I’ve had four more clients stand on the podium since. 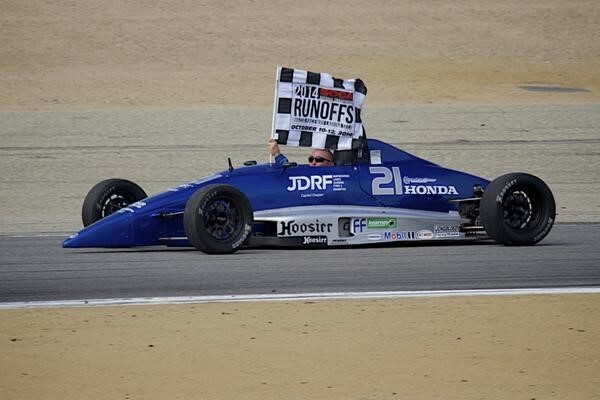 Last year I was tickled when Formula F competitor Jeremy Grenier told me that after a tough day of qualifying, he went to my Daily Dozen List for Runoffs Sanity Retention (see end of article). “I took out my list and read number one,” said Jeremy. “And I said that’s it; that was my “down” – my one bad day.” And he went for a six-mile walk. Jeremy won the Formula F race and was awarded the coveted Mark Donohue Award by the Road Racing Drivers Club. In addition to my Daily Dozen, I offer these thoughts from both the driver’s seat, as well as a coach’s viewpoint. Come up with reasonable goals and take realistic and thoughtful steps towards those intentions. If you’re going to Daytona, put a smile on your face. Happy drivers go faster. Really. In for a penny, in for a pound. The Runoffs are expensive no matter how you cut it. If you try to do it on the proverbial shoe string, it will break. Track time, travel costs, tires, motors, lodging, etc. all cost money and you can’t wish that away. You need to be realistic about money. You don’t go to Vegas to save money, but you don’t want to lose your house, either. You can’t feel good about your progress and performance throughout the event if you are constantly obsessing over finances. Spare yourself the hand-wringing about club racing costing so much, etc. You chose to come to this dance - get ready to spend some dough. You can write a letter to somebody about it over the winter as your credit cards heal. Whatever the level of your commitment, be realistic. Then for the duration of the event, put the cost out of your mind. Testing is highly recommended. If you hope to be remotely competitive, some testing is all but mandatory. You will hear stories of the guy who showed up the third day of qualifying and put it in the top ten or whatever. Even if true, these are epic tales of extraordinary talent and luck. Daytona may appear straightforward on a track map but with enough cars on it, things will get sketchy. There are more things to test than you will conceivably have time to accomplish. More importantly, you need to get comfortable with the fundamentals: sight lines, braking zone distances, drafting, and clean acceleration on corner exits. Have a plan each day and stick to it. At the Runoffs, time seems to expand and contract. Both the length and the magnitude of the event work to pull drivers off their game. At a weekend race you barely have time to think, let alone plan. Before you know what happened, you are on your way home. At the Runoffs, there is so much time to do things that you take too long to do them. Or you get lost in unnecessary tasks. Suddenly it seems that you are out of time and need to rush the work. Decide to be early for everything. Just because you have all day to work on something doesn’t mean you should take all day to do it. Don’t commit to long tedious projects just to fill the time. Stick to your familiar rhythm and pace in the paddock. Focus on your game, not theirs. This is easier said than done - racing is a game of comparisons, after all. But you can’t really do much about the other cars anyway. Your job is to get all you can out of your car. You can check out the lines of your competitors, but obsessing over their lap times, straight line speed or equipment in general is a toxic distraction. How does that make your car faster? Whose car do you care about? Stay focused on your own car and your own performance. That is all you can manage. Find a way to break the tension. Even Type A’s get the blues and you can’t work all the time without draining your battery. Unless you stay alert to this, you will never even see it coming. You will begin to make mistakes and you’ll wonder why. You can only tense a muscle so long. You have to manage your emotions like your racing equipment. Unlike the weekend event, you have a long time to stew in your competitive juices and it’s not always a pretty sight. Take a break. Get away. Talk to people. Don’t let yourself get wound too tight. It is not just another race, but you want to act like it is, on some level. You have to figure out a way to enjoy the process. Get in the mood. It is not all about the car. Look for the sweet spot in your helmet. Your mental outlook matters a great deal. We all have our best mental performance mode. Pay attention to how you reach yours; don’t just hope it will happen spontaneously. This is where experience has a big impact. Every now and then, a Runoffs rookie triumphs, but drivers who have been at the big show before know it can be a roller coaster. You have to think about how you can ride out the ups and downs and stay centered for the long haul. Drive the car, avoid the drama. Put enough alley cats in a confined space and there will be some hissing. The caliber of the event is a siren call for frayed nerves. Your brain can be a sponge for these bad vibes. Stay the course; avoid the dreaded Runoffs meltdown. My racing guru, Steve Cole, who now heads up Cadillac Racing, had a litmus test for any subject that came up at a race. Does thinking and talking about the issue make our car go faster? If not, drop it and deal with it at a later date, if ever. You don’t have to engage every transgression, real or imagined. If feel you were run off the road and you can pull yourself together for a reasonable, low key discussion, great. Otherwise, let it go. Grudges don’t help, they get in the way. Serenity now.